With Inauguration Day here, politics and government policy will continue to be a focus area for the markets. Over the past few months, President Trump has outlined a number of areas for potential changes in government policy. During each corporate earnings season, it is not unusual for companies to comment on subjects that had an impact on their earnings and revenues for a given quarter or may have an impact on earnings and revenues for future quarters. While the majority of S&P 500 companies will report earnings results for Q4 2016 over the next few weeks, approximately 8% of the companies in the index (42 companies) have already reported earnings results for the fourth quarter (through Wednesday). Have companies in the S&P 500 been commenting on government policies that may change under the Trump administration during their earnings conference calls for the fourth quarter? 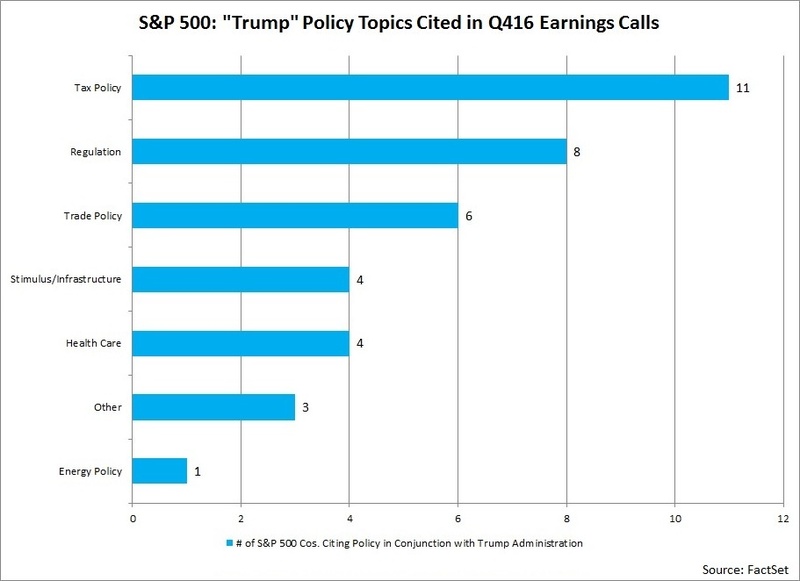 To answer this question, FactSet searched for the terms “Trump” and “administration” in the conference call transcripts of the 42 S&P 500 companies that have conducted fourth quarter earnings conference calls through January 18 to see how many companies discussed these terms. FactSet then looked to see if the company cited or discussed a policy topic in conjunction with the citation of “Trump” or “administration.” The results are shown below. Of the 42 S&P 500 companies, 27 cited the term “Trump” or “administration” during their Q4 earnings calls. The term “administration” was only counted if it was used to reference the Trump administration. In terms of government policies in conjunction with the new administration, tax policy was cited or discussed by the highest number of S&P 500 companies at 11. Six of these 11 companies stated that if taxes were lowered, it would benefit their clients or themselves. Please note that companies that cited or discussed a potential border tariff or tax were counted under “Trade Policy” and not “Tax Policy” in the chart. Please also note the numbers will not total to 27, as some companies discussed multiples policy topics, while others did not discuss any specific policy topics.